Wow, that's knock-your-eyes-out gorgeous! Well done! Really lovely--thank you for posting those photos. I love it! It is gorgeous. 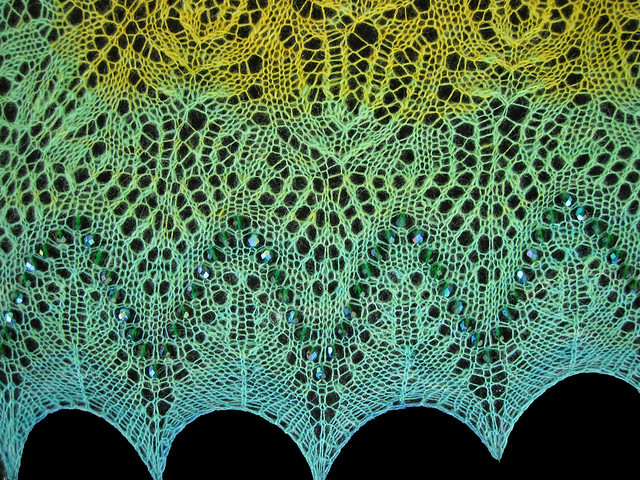 Gorgeous shawl complimented by equally gorgeous photography! exquisite! 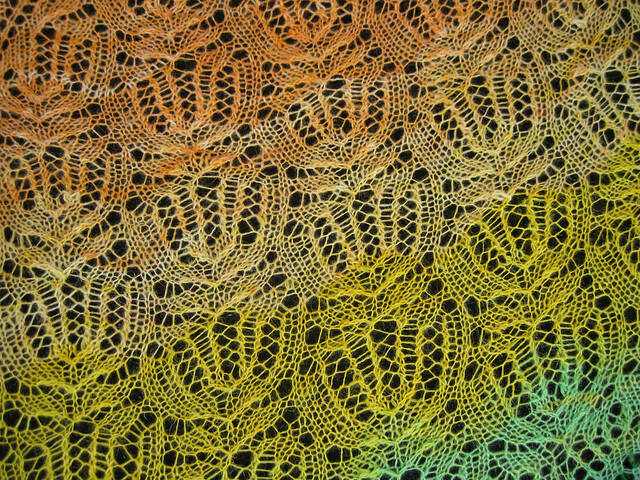 It is now moving very very far up in my lace queue; you are one talented human being, Fleegle! The colors make me think of a bowl of orange, lemon, and lime sherbet. That is one eye-catching shawl! 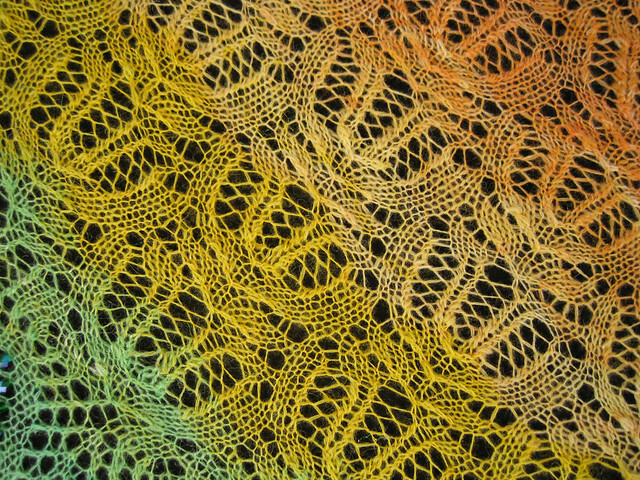 I tried to knit that flowery stitch in the yellow part once, and gave up in desperation. Wow! Normally I would never consider knitting a shawl with a center increase line like that, but that's so lovely I might have to try. And the yarn colours! So beautiful! Talk about yarn p0rn! OMG, that is gorgeous. That came out beautifully! I just love the fact the beads are actually visible but don't clash with the chosen colour. Excellent work! That's a fantastic rendition of Percy. It's amazing how much color can transform. I'm always fascinated to know another knitter's impressions of and experience with I pattern I used and liked. Percy was the blueprint for a wedding veil I knit. I faved a hank of yarn in your shop for it, but the bride insisted on pure silk (sigh), and pure ivory. It's so gratifying to see Percy as I would have liked to knit it. That really is lovely. The beads are a nice touch! Great idea. Wow, 2ply spun on Tibetan Spindle? Love your blog, your pictures and your videos. Warm regards to Roy and Harry and Rambo too. Only to say that I am in love with it! 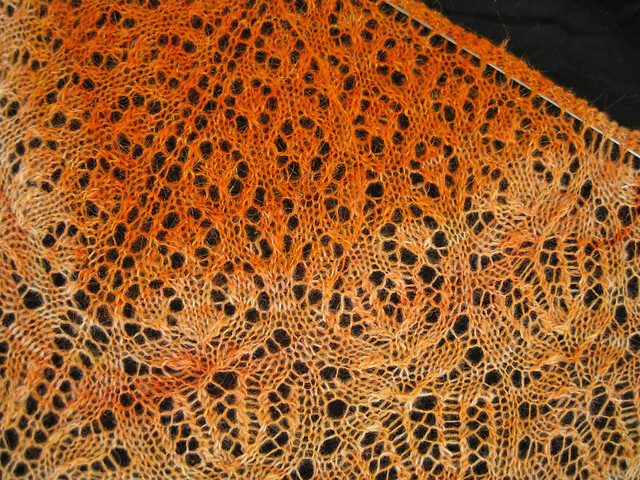 Holy crow, Fleegs, that's a seriously impressive shawl. Brilliant to spin from one batt to make one subtly shade-changing yarn! You say it's a two play--did you split the batt and spin each half separately? If so, bravo for getting the colours to match up perfectly. Oh my my. That is one of the prettiest Percys I've seen. Lovely yarn, beautifully executed Brava! It's gorgeous! I love the color gradations! That's just about the purtiest thing I've ever seen. And thanks for the link - it's a lovely pattern. The colors grab your eye and won't let go. Beautiful. Very Cool. Beautifully done and a great choice of colors. I have never knitted frost flowers, but I love it. Always have, and someday I'll get around to knitting it. I usually don't care much for beaded knitting, but I do like the way the beads accentuate those strong arch shapes at the edge. Faints dead away....reviving just long enough to say - breathtaking!! 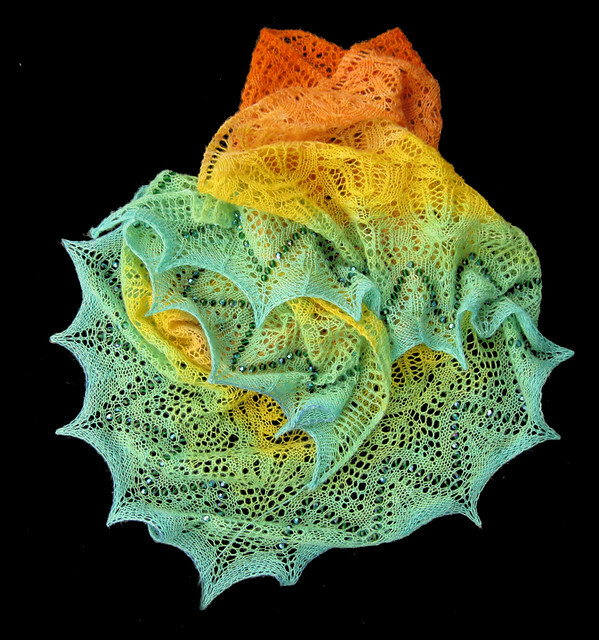 Wow...I just went to Ravelry to favorite this shawl, and discovered it's what I've been knitting for THE PAST WEEK. I don't know why the name didn't stick in my head! And obviously I've been a little slow...I did recognize the first section as the same as mine. Yours is stunning, though! It makes mine weep in jealousy. That is just spectacular. The color shifts are breathtaking. What a beauty - and such fine and even spinning. I am finding it difficult to describe how much I love it; the spinning, the knitting, the pattern selection, beads, and topped by photography that makes you want to reach through the monitor. Very pretty, and what a good idea to use beads instead of nupps! You are just determined to get me into spinning, aren't you? Hey Fleagle. I ran across your blog while looking for my daughter's blog on BlogSpot. The name caught my attention first, and then the beautiful spinning and knitting. Your work is spectacularly beautiful, rivaled only perhaps by that of my ex-wife, who was nothing short of a master, particularly with spinning. I still have a sweater that she knitted for me out of hand-spun alpaca...apart from the memories and a few old pictures, one of the few things remaining from a marriage that commencedand ended before its time. Your work is truly lovely. The name of your blog caught my attention because my ex was given to attaching cute names to things that were often imaginary or inanimate, such as her invisible aardvarks, and she actually named our ceramic fireplace, yes, you guessed it, "Fleagle"--it used to fleage on cold New England nights and keep us warm. Anyway, my daughter is an avid knitter and will surely appreciate your work as well. My wife has also taken up weaving and loves textures and colors, as you clearly do. Keep up the great work and the lovely, interesting blog. Holy Cow! That is beautiful!!! That might be the most beautiful shawl I've seen. Love the colors; the beads are an added surprise treat. Amazing! I am in awe of your spinning and knitting skills. The Green Woman just dragged me to the computer to show me your beautiful shawl. She was very excited and has already got out my wee spindle and some fiber because she wants me to get to work. Seriously, it is gorgeous, and cheery and I absolutely love it! Just beautiful! It even looks soft, so I bet it is. Oh wow! That shawl is stunning! 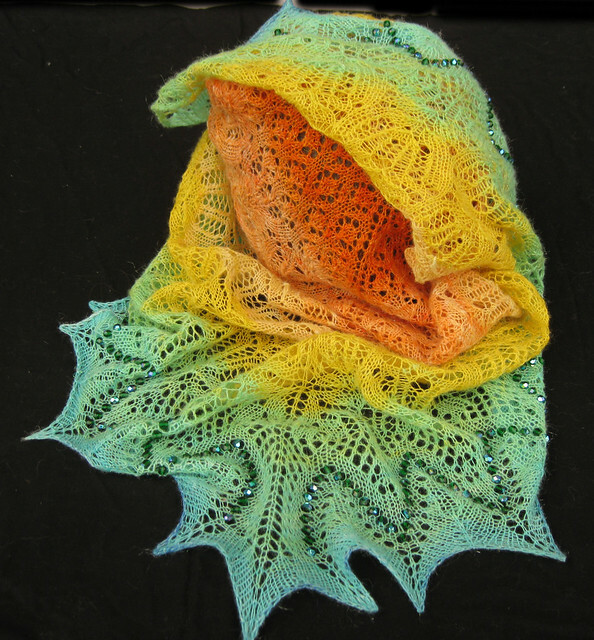 What a spectacular shawl! I love the color progression and your spinning was fabulous. Gorgeous colors and what a good idea to add glass beads instead of dots! I want it! I was considering this pattern but changed my mind, did you like knitting it? The colors are fabulous and stunning! I admit and I ahve been bad and not reading blogs. The yarn is stunning!!!!! And I ahve printed out the pattern. What I am spinning right now might work. I will not know though until it is plyed. Wow -- that's a piece of lovely I wasn't expecting this morning while I was searching for a better knitting chart software than the one that crashes when I try to save my chart. Your colors and your spinning are astounding. Very, very nice. Wow, again. Sooooo pretty ... amazing colours ... you'll be noticed wearing that ! This is Gorgeous!! The pattern was Exquisite to begin with - what you have done (handspun gradients) in the yarn, is beyond incredible. WOW!!! Absolutna perfekcja!!! Coś pięknego!!! Pretty beaded rainbow shawl, I think I love you! Wow! 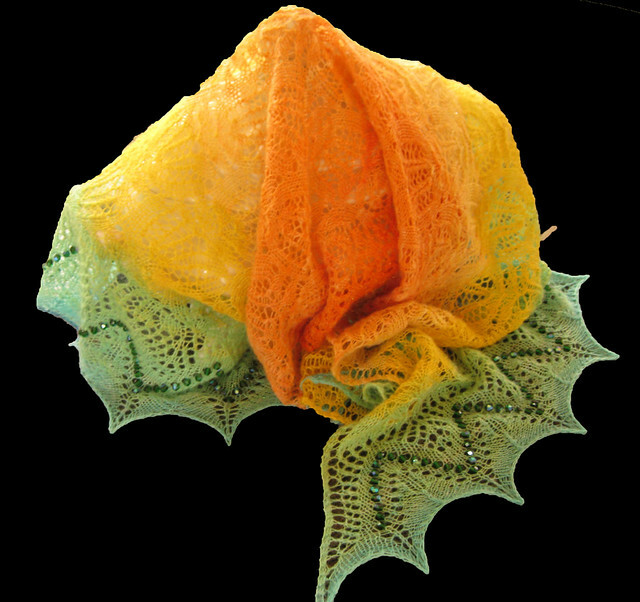 What a rainbow Color Shawl..truly It is looking so lovely!!!! Absolutely to die for! Does not surprise me a bit coming from your hands. i love this, and i can't get it out of my mind, thank you. 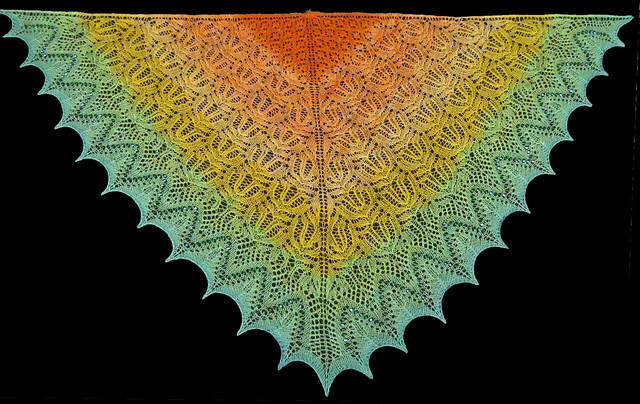 Fleegle, this is the most beautiful shawl I have seen in looking at your blog for several years. (High Praise, indeed.) The fact that you spun it, and dyed it so masterfully is stunning. Wow!!!!! !